Prepare the sweet corn: soak corn in husks in cold water for 30 minutes. Heat grill to medium-hot. Peel back husks, leaving them attached. Remove the silks. Pull the husks back over the corn and tie with another piece of husk or cooking twine. Grill ears 20-25 minutes, turning occasionally to roast all sides, until kernels are soft. Alternatively, roast corn in oven: Preheat oven to 350°F and place corn in husks (no pre-soak needed) directly on center rack and roast 30 minutes, or until kernels are soft. Allow corn to cool slightly, then remove husks and silks and cut corn from the cob into a large bowl (you should have about 6 cups corn). In a large saucepan over medium-high heat, heat olive oil. Add corn, tomato, green chilies, onion, potatoes and salt and pepper and stir. Saute until onions are softened, about 5-7 minutes. Add vegetable broth and bring to a boil. Reduce heat and simmer 20 minutes, uncovered, until potatoes are tender. Using an immersion blender or blender, puree half of the chowder until smooth. Stir in half and half, chili powder and lime juice and simmer until heated through, about 3 minutes. Serve in bowls topped with a spritz of lime juice, cilantro, chili powder and crumbled anejo or cotija cheese or queso fresco. Confession time: I’ve never really been a big fan of corn chowder (but I AM a big fan of saying “CHOWDAH!” in a thick Boston accent every time I hear the word). I do enjoy me some Mexican grilled corn in the summahtime, though (I’m afraid the rest of this post will now be in a Boston accent). Grilled corn on the cob is great and all, but when you slather it with some mayo, chili powder, lime juice and crumbly cheese, oh my LAWD. My mouth is never more thankful. So it’s unsurprising that my lifelong streak of disliking corn chowder (sorry – CHOWDAH!) 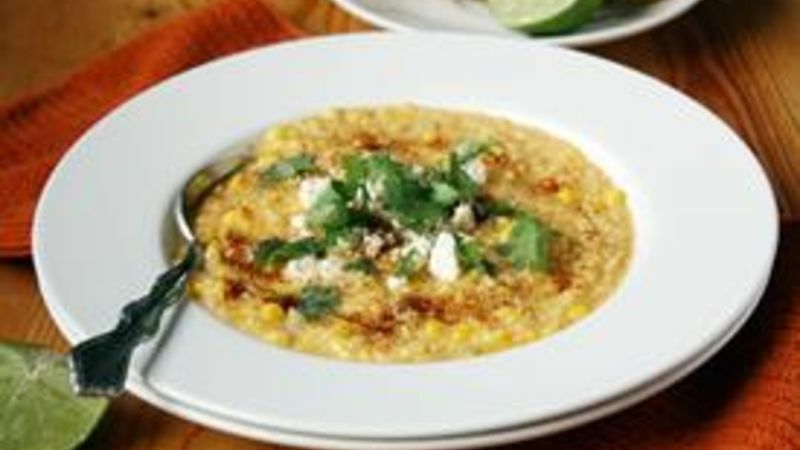 ended when I made this Mexican Grilled Corn Chowder, which combines the two. Chowder made with classic Mexican grilled corn ingredients?! Sign me up. People, this stuff is good. Whoever said you can’t put lime juice, chili powder and crumbly cheese into a corn chowder was wrong (wait, no one said that? Well they’re wrong anyway). The fresh summer ingredients give this soup, usually reserved for those chillier seasons that shall remain nameless, a bright, flavorful and refreshing kick. Sure, it doesn’t taste 100 percent just like Mexican grilled corn thanks in part to the difference in texture, but it’s pretty darn close. And my mouth is just as thankful with a spoonful of this chowdah. I like to use fresh, grilled sweet corn right off the cob when making this recipe so the flavor is as authentic as possible, but feel free to use canned or frozen corn to speed up the process. I also prefer using chipotle chili powder for the smoky taste, but regular chili powder or even cayenne pepper also does the trick. And it goes down especially well with a cold Mexican beer and a thick Boston accent to entertain/annoy your dinnermates. Just sayin’.